Yahoo on Thursday released the 2013 version of its Fantasy Sports app for the upcoming NFL season, offering a revamped look, performance improvements, and the ability to draft players from an iPhone or iPad. Perhaps the biggest draw of Yahoo! 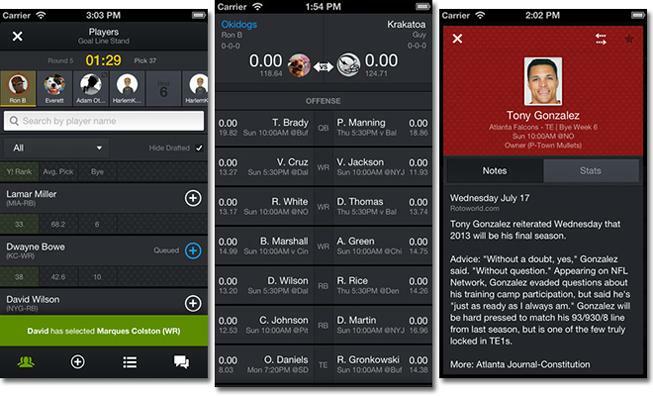 Fantasy Sports version 5.0 is the mobile drafting feature, something that users have been requesting for some time. With the updated app, players can pick players, manage their queue, check draft results, and participate in live chats while on the go. In addition to mobile drafting, a new mock draft function lets players practice before the football season begins, while a redesigned interface promises faster app navigation. Features carried over from previous versions include real-time scores, news, stats, and message board. Finally, the latest version of Yahoo! Fantasy Sports will later become the central hub for all of the company's fantasy titles, bringing now separate apps for basketball, hockey, and baseball under one title. Yahoo! Fantasy Sports is available for free from the App Store as a 33.6MB download.